While strolling YouTube recently I came across an apple orchard owner in England who does video blogs. Stephen Hayes' channel is full of charming, down to earth videos like this one, where he walks through his orchard and talks about his trees. He says it is important to keep heritage specimens alive in the horticultural world. This sentiment really resonated with me. I am a big fan of vintage plants and I believe that just because something is new doesn't necessarily mean its better. I'm definitely an aficionado of classic. 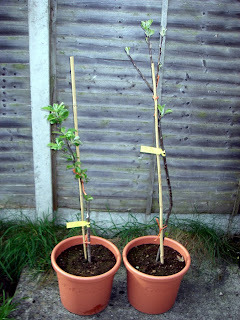 After watching this video I decided to find a nursery that stocked rare apples and purchased a pair of May Queen trees. This is a variety from 1888. I found it at Deacon's Nursery on the Isle of Wight. Mr. Hayes plea to keep heirloom varieties of apples alive really struck a chord with me. Perhaps it was his lament that we are losing the DNA of old varieties, or his sadness over the loss of a very good nursery that specialized in his favorite type of tree. I felt the same way when Mountain Maples closed their nursery; they specialized in Japanese Maples. So anyway, here are my little trees. 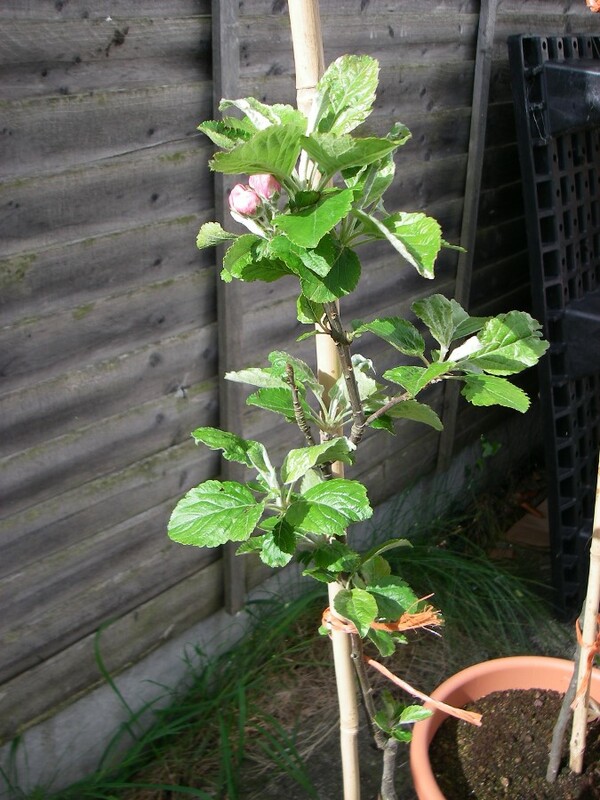 One tree is on M27 patio-tree rootstock, which keeps the height of the tree at about 4 feet. 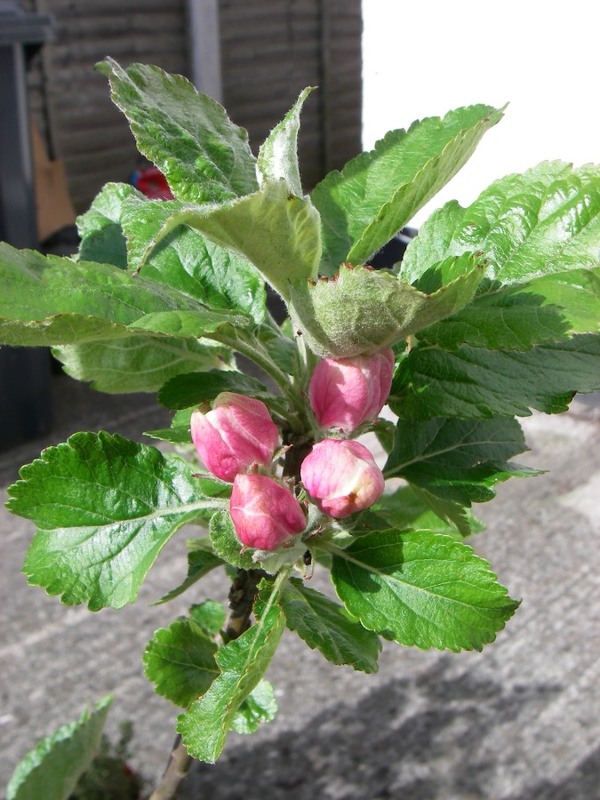 This is great for an ornamental standard which still will produce fruit. 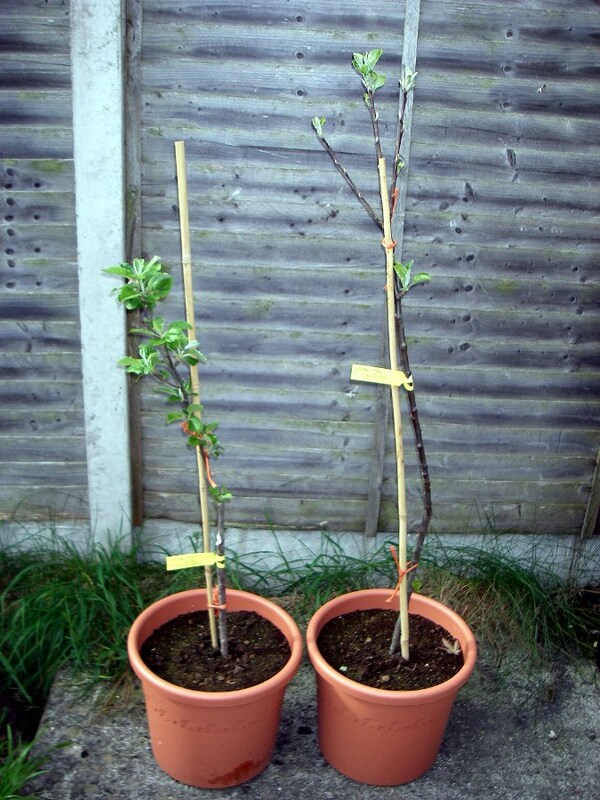 The other tree is on M26 dwarfing rootstock. This tree will eventually reach 8-10 feet tall and is perfect for a yard. My awesomer-half and I are currently renting our house, so you may be wondering why I bought a tree that needs to go in the ground? Well, my awesomer half's parents enjoy apples, and so that tree will eventually go live at their house. I'm really looking forward to seeing fruit on this tree some day! The taste is described as nutty, Earthy and crunchy with a fair bit of acid. Sounds like a lovely apple. Yum yum! How many years do I have to wait to book a trip for a Dublin apple pie? Kidding!